A North Korean ship being tracked by the United States Navy on suspicion of transporting weapons to Burma has turned around, US officials have said. They said they did not know where the ship was now heading, but South Korean media said it was going home. The UN passed a tough sanctions resolution, Number 1874, allowing for inspections of air, ship and land shipments in and out of North Korea. The resolution followed North Korea's nuclear and missile tests in May. 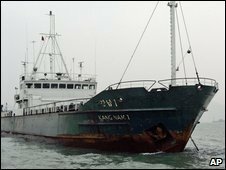 The Kang Nam 1 ship set sail from North Korea on 17 June and appeared to be bound for Burma, as US ships followed it down the coast of China. It is the first vessel monitored under sanctions that ban the regime from selling arms and nuclear-related material. It has been described as a known weapons trader. Burma denied any connection with it. After sailing southwards past China, the Kong Nam apparently turned around and headed back up north. One official said it was just south of Hong Kong on Tuesday. Others noted it had started travelling very slowly, perhaps to conserve fuel. "We've no idea where it's going," the official said. "The US didn't do anything to make it turn around." The UN resolution allows the international community to ask for permission to board and search any suspect ship. Authorities can ask for an inspection wherever the ship pulls into port. "If the ship is on its way back, it would mean that Resolution 1874 is taking effect and causing the North to retreat," defence analyst Kim Tae-woo told the Korea Herald newspaper. The US Ambassador to the UN, Susan Rice, has confirmed that the US was "pursuing and following the progress of that ship very closely."